The fact that “A Quiet Place” received a score in the nineties on Rotten Tomatoes reveals the sorry state of the horror movie genre. The film boasts a novel core idea, but its execution is iffy at best. There were definite moments of heightened tension and fear, but they often rely on cliché horror techniques that grow tired after the first few times they’re employed. Although I’m critical of the movie, it’s a worthwhile watch, and—you’ve been warned—spoilers follow. “A Quiet Place” does a remarkable job of storytelling without dialogue. In the first minutes of the movie, a family raids a dilapidated drug store for medicine and electronic equipment. They do this in complete silence, struggling not to let anything they grab crash to the floor. As they leave, the camera reveals that the whole city is abandoned and empty. A newspaper flaps in the wind, briefly showing its headline: “It’s Sound!” Without any dialogue, the film reveals that something is listening, and the eerie silence suggests that same something represents a sense of impending doom. The subtle form of “showing rather than telling” persists throughout the movie. Unfortunately, the movie also revels in jump scares. Are all jump scares lazy? Certainly not, but they are in “A Quiet Place.” Startling people with a loud noise and an image is not difficult or complicated. The technique isn’t inherently bad. Jump scares can work well when they add to the suspense and atmosphere of a movie; however, there are a lot of instances in “A Quiet Place” in which the jump scare feels like the entire point of the movie. The monster appears suddenly, making an oppressively loud noise for full effect. It’s odd to me that a monster with hypersensitive hearing who silently stalks its prey is so loud when it takes a victim. But without the ear-splitting noise, the jump scare may completely fail to be frightening at all. The adherence to jump scare clichés is a shame because the core idea for this movie is fresh, and there are a lot of legitimately scary moments in the movie. Millicent Simmonds plays Regan, the deaf daughter of the family, and occasionally the audience hears what little she hears. Near the end of the film, Regan removes her defective hearing aid, leaving the audience in complete silence. As she does this, a monster creeps silently behind her. The theater I was in audibly gasped as it happened. Another quality moment occurred when Evelyn (Emily Blunt) dragged laundry upstairs, and the bag snagged a nail, upturning it. It was clear that someone would eventually step on this nail and probably scream, exposing themselves to the monsters. The inevitability of stepping on the nail created suspense that remained long after characters eventually injure themselves. For a movie with “quiet” in the title, you might expect a lot of these types of scares, but the movie relies far too much on sound for sudden, jarring startles. When it isn’t attempting to damage my hearing, the soundtrack is a pleasant listen. The music doesn’t demand too much attention but breaks up the monotony of silence. The music adds to the non-verbal storytelling, revealing and developing the relationships between characters. It’s done so seamlessly that it feels natural during the viewing. For a horror film, the relationships on screen were incredibly well developed. However, with its speedy runtime, the film would have benefitted from fifteen more minutes of character development. In an early moment of the plot, Regan gives her younger brother a loud toy without her parents knowing. The toy suddenly makes a sound as they are traversing the forest, leading to the younger brother’s death. Nearly a year later, Marcus (Noah Jupe) asks the patriarch of the family, Lee (John Krasinski), if he blames Regan for her younger brother’s death. Lee’s response is tender and loving, but it’s clear that he does blame Regan to a certain extent. This is by far the best scene in “A Quiet Place,” and it makes the audience wonder what the family members are keeping from each other. I left the theater wanting so much more of these interactions. Though the family dynamics are explored a bit, they all center around Lee. When Lee ultimately dies trying to save his family, the movie loses much of the potency it had. There is a suggestion that Evelyn and Regan have compelling backstories, but they go largely uncharted. This made it more difficult to empathize with these characters at the would-be climactic ending. It’s a shame because the resolution of the film was quite clever. “A Quiet Place” has a strong foundation with no plot holes. That’s a whole lot more than most horror movies today can claim to have. The movie also builds on its idea with its character development. These two triumphs of the movie offer enough to make one look past a lot of the awkward faults. In many respects, Krasinski’s direction deserves a lot of praise, especially given that this is his first horror film, but it doesn’t warrant a near-perfect Rotten Tomatoes score. 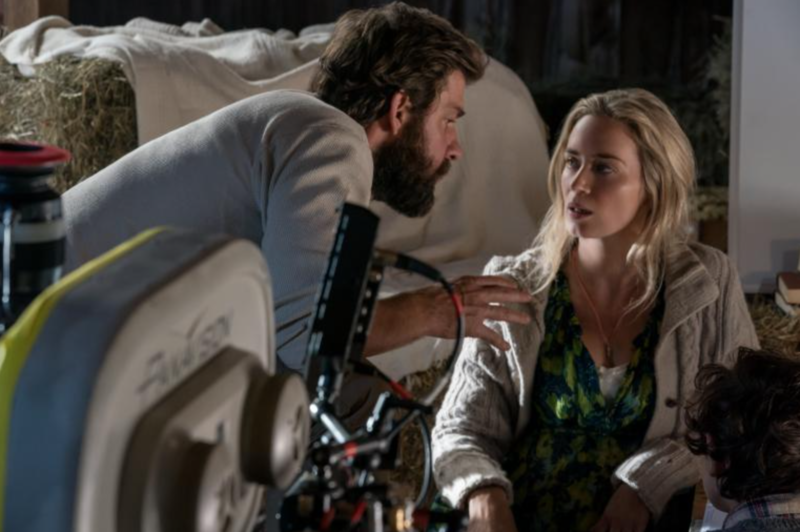 There are many positive aspects to “A Quiet Place,” but it is also so painfully close to being an excellent movie that it becomes more frustrating than entertaining to watch.